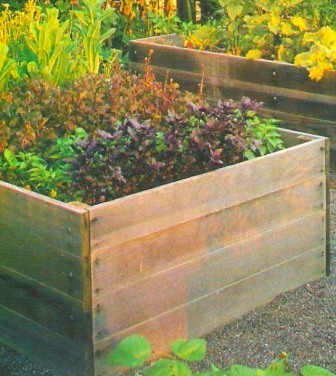 A raised bed vegetable garden can offer you so many advantages as they are basically fixed. When I started growing my own vegetables, I was very open to incorporating raised beds in my garden. You see raised bed gardens are permanent plots surrounded by narrow paths. When I established a raised bed vegetable garden, I didn’t need to dig often, only about every 5 years or so and best of all, block planting was very easy. I decided to build a raised bed garden after reading through some gardening books for some inspiration and ideas. The idea seemed really convenient for me and I decided to do it since it’s relatively easy. The width of your bed should be about 4ft (1.2m) as that size will allow you to reach from each side comfortably. They should be no longer than 5m (16ft) or you may end up walking over rather than around them. Having permanently fixed beds makes record keeping and crop rotation an easy process. That’s pretty good for any gardener especially if you’re very particular with planning. I was having a conversation with a friend about raised beds, how they work and how efficient they can be. I explained to her that fixed beds gradually become raised beds naturally as the compost; mulches and root residues build up. Not only are they less back-breaking to work, but raising the soil level can create so many advantages. As the bed builds up, the surface area expands and not only will this allow some extra planting space, but also increasing aeration and evaporation. The soil warms up faster and you can start earlier in spring. My friend was amazed and didn’t know that raised beds were that simple and convenient. Of course it will take some time to set up and plant but once they’re established correctly you should be able to grow vegetables easily. In winter the crops that are on top are in mildly warmer conditions as cold air runs off to the lower levels. The only thing I have with raised beds is that they tend to dry out faster during summer and sometimes mulches tend to slide off. However don’t worry; the advantages outweigh the problems, especially if the shape is kept to the natural curve formed by the soil. This supplies a lot of useful micro-climates. You can have your bed running north-south where the sunny end is a hot slope. The hot slope can be used for early cropping and herbs where on the shaded end you can grow some salad as well as leaf crops. Salads are very easy to grow and they fit very well in a raised bed vegetable garden. The sides of the beds are protected from the wind and stays moist suiting roots, leeks and salad crops. The top is open-ground but is ideal for shallots, legumes and brassicas along with some overwintering vegetables. These vegetables above can be grown in rows. I noticed in my raised bed vegetable garden that the paths of compacted soil are sufficient but tend to get muddy in the wet. I always recommend using sharp sand or crushed gravel and it wouldn’t matter if some gets mixed into the soil. At present I was able to get some delicious salad and lettuce crops from my raised bed vegetable garden. A raised bed vegetable garden is an exceptional choice especially if you’re not really a fan of digging. You just have to take your time and take note of some guidelines as well. For more tips and guidelines for growing vegetables in raised beds, check out the following links below….